Apparently, the flying reptile phenomenon was big in the 1800's. Bigfoot enthusiasts who use old newspaper accounts of "wildmen" and "gorillas" in American woodlands might want to be more cautious in their claims. Seems that there are old newspaper accounts of a whole bestiary of fanciful creatures, including flying reptiles. I knew about the Thunderbird, but not the rest of them. That was interesting, I wonder if they mistook the California Condors for these things. Based on what I read they were more wide spread a few hundred years ago. Last edited by Jodie; 5th January 2013 at 08:49 PM. Would a person claiming a modern living pterosaur sighting be considered woo, or just a common everyday mistaken person? If they said "I definitely saw a pterosaur out of my truck window, it was no big bird, it had a long snout and leathery wings and was 20 feet long"
Then most Bigfoot Believer people aren't woo at all, because they wouldn't describe their strength of belief at 100%. Jodie, ask 5 people to show you tall their neighbor's dog is holding their hand at about the right above the ground. Then, measure that distance. I'd bet most of them will be way too high/low. I think most footers are more like sheep/followers, it's the ones making false claims and lies with their so called research that would be woo. Just reading about the incident, I would give the person the benefit of the doubt and simply say they were mistaken. They might be stark raving mad for all I know,which goes a bit beyond the woo factor. I've never liked qualitative percentages like that. Most are meaningless. If you act as if you believe it, or based on that belief, you're certain for any non-pedantic definition of the term. You want to talk stats, give me the numbers and the equations. It also means that we can't call someone woo if they have any doubts whatever about the quality of the evidence, which clearly contradicts SOP with statistics (they use some standard of significance, usually 95% [but not always--PAUP's bootstrapping and jackknifing standard is 50%]). What you're saying is that even an insignificant doubt makes one not woo. In other words, being certain in most statistical discussions means being 90%, 95%, or 99% certain. I could have very easily been mistaken about the height, I've made mistakes in depth perception and size before, especially now that I've gone to bifocal contact lens since then. This was 5 years ago, it was right on the other side of my passenger window. I think I would be hard pressed to misjudge that incident, but the others? It's a very good chance that I did because of the distance. Not to take the discussion too far afield, but WP seems curious as to what constitutes woo as it relates to seeing and believing in cryptids. As a starting point, I look at what I would consider the innate plausibility of the cryptid in question. It is a unicorn/pegasus distinction. If some one claims to see a horse-like animal with a long horn protruding from its head between its eyes, or claims there is a species of such an animal existing, I would require good evidence for its existence. I would not rule it out as a possibility, because there does not appear anything about such an animal that would rule it out of bounds as a naturally occurring animal. On the other hand, if someone said they saw a horse with large bird-like wings, and that horse was able to take flight as easy as any bird, I would not hesitate in dismissing the account out of hand, due to the obvious contrariness of such a creature to our hard earned, progressive knowledge of the world. If people believed the pegasus "eyewitness," I would consider their belief woo. Second consideration would be the plausibility of the cryptid in a larger context. If thousands of people were claiming to see horse-like animals with horns ("unicorns") in various mundane places, and over time, and no definitive verification ever occurs, then I would find such a proposed cryptid slipping down the plausibility slope to the inviting pool of woo. As for "certainty," I find that folks are certain about alot of things that we ought not be certain about, at least epistemologically. This is due to traditional beliefs, wish fulfillment, intuition, ignorance, or a host of other belief inducements and causes that we usually don't associate as necessarily components of a woo factory. No, I'm not saying that. I was restating and emphasizing what StankApe said in order to show my disagreement. He thinks that if a Bigfoot Believer and Eyewitness isn't certain about their sighting then they aren't woo. It was me that equated certainty with "100% strength of belief". When I wrote that one-liner I took Stanky's idea to its logical conclusions. It becomes absurd when you think about it. If you seriously think that Bigfoot exists then you are woo. If you seriously think you saw a Bigfoot then you are woo. well that's what I was saying too. If somebody says "I don't know what I saw, but it seemed similar to one of them Bigfoots I hear about" I don't think you are woo, just mis identifying an animal. Folklorist J. Frank Dobie wrote a story about the Onza in 1931, but it was a tall tale, giving the cat supernatural shape shifting attributes. Big game hunter Russell Annabel wrote an article about the Onza for Sports Afield in 1961, detailing his killing of the big cat. He described the Onza: He looked like a heavy shouldered, lean-hipped puma with an uncommonly small head -- except he had a black tail-tip and a black line on his back from the kidney region to the tail. He exactly matched descriptions of the onza that we’d had from scores of vaqueros, meat-hunters, timber scouts, wandering Indians, and wildlife-wise residents of the lost, forlorn wilderness villages. There was no doubt in my mind that the animal would be new to science…. Annabel sent the bones and pelt to Sports Afield and the magazine forwarded the remains to the American Museum of Natural History in New York for identification. It was determined that Annabel had killed a puma. In January 1986, an Onza was killed in Sinaola. Cryptozoologists from the International Society of Cryptozoology, Richard Greenwell and Troy Best, investigated. Greenwell described the dead cat: It had a remarkably gracile body, with long, slender legs and a long tail. The ears also seemed very long for a puma (about 100 mm), and small horizontal stripes were found on the insides of its forelimbs, which, as far as determined to date, are not found in puma. Tissue samples and bones were collected. At Texas Tech, an electrophoresis comparison with a Big Bend puma sample showed no difference between the Onza and the puma. Later, mito-DNA tests were run at the National Cancer Institute in Washington and the results showed that the Onza was genetically indistinguishable from a puma. There may be a linguistic explanation for the Onza, more than a biological one. In the June 2008 issue of Mastozoologia geotropically, Ernesto Alvarado Reyes makes some interesting observations about The legend of the Mexican onza. He states concerning wild felines in Latin America, …it is very common that one species receives two different names in the same locality. The name onza is usually applied in this sense. This leads to the common misunderstanding that there are two different species that in fact are just one. Reyes argues, The word onza in Mexico, when applied together with another common name to refer to the same species in the same locality, is used to distinguish certain varieties or individuals with recessive traits that make them look different to most individuals of their population. Sometimes, as the rarest phenotypes that is called onza is the less frequently found, incredible stories far from reality are created around it. Whatever the case, I went to central Mexico recently to visit my loving and lovely Mexicana wife, and while hiking the piedmonts with her and her brother, I asked about the onza and they both are sure of its existence. They say it isn't a puma. Last edited by jerrywayne; 18th January 2013 at 07:15 PM. Trunko is the name cryptozoologist Karl Shuker gave to an unusual sea animal seen in November, 1922, off the coast of Natal, South Africa and later found on the beach near Margate, dead. On November 1, according to a newspaper account, among many witnesses, a Huge Balance viewing from shore could see oceanic fisticuffs in the form of "two whales fighting with some sea monster." The article continues: He got his glasses and was surprised to see an animal that resembled a polar bear, but in size, was equal to an elephant. This object he observed to rear out of the water fully 20 feet and strike repeatedly at the two whales, but with, seemingly, no effect. The fight went on for fully three hours, gradually nearing the shore, but it grew too to make further observations. Next morning the man found the monster high and dry on the beach. The impression the eyewitness had concerning the sea monster, that it was an elephant sized polar bear-like animal, and others' ideas that the creature indeed had an elephant-like trunk, and that it was fighting furiously with two orcas, were mistaken. In all probability, they saw two killer whales feeding off of a dead whale, moving it around as they fed. The "globster" on shore was all that remained, the whale's skeleton probably at the bottom of the bay, it's flesh torn away. Impressions of the rotting dead animal also contributed to what people thought the creature might have looked like while living. Last edited by jerrywayne; 19th January 2013 at 06:15 PM. I can just imagine, a giant sturgeon washed up on a beach here in SC and caused a big stir not too long ago. In it 's decayed state you could easily imagine a dead dragon or a sea serpent. I had no idea sturgeons got that big. Do you recall how large the fish was? I brought up the Trunko story because it demonstrates how people will take ambiguous stimuli and "see" things less ambiguously, even if their interpretation is very far fetched, like seeing an elephant sized polar bear fighting two killer whales. The Trunko case also reminds me of the time a co-worker and I were watching a hawk trying to carry off a squirrel on the front lawn. It would carry the squirrel a few yards at a time, and then land. We first saw it not twenty yards from us; after it got a hundred yards or so away, we went back in. Last we saw, the bird was still having difficulty keeping in the air with its prey. When we got back inside, I was surprised to hear my co-worker tell everyone that the squirrel was putting up a really good fight with the hawk. I saw it differently: the squirrel was definitely a dead squirrel, killed before we were even on the scene. There's considerable speculation that at least some Lake Champlain "Champ" sightings are actually of extremely large sturgeons. Even without the " I swear it was thiiiiiiis big" phenomenon, these guys can get Awfully damn big! In 1941, near Ruby Creek, British Columbia, a First Nation woman named Jeannie Chapman was terribly frightened when she saw a sasquatch approaching her home. The event made a local newspaper. Sixteen years later journalist John Green began investigating the possibility that North America was home to a Yeti-like ape and he interviewed Chapman, and others, about her sighting. Since her sighting was supported by tracks, he found her account even more instrumental than Roe’s or Ostman’s in convincing him that sasquatch were real. In the way Sanderson portrays it, the incident seems virtually conclusive. Mrs. Chapman is honest. Her sighting was under good conditions: broad daylight, cloudless skies, and of long enough duration (in minutes) and proximity (up to 100 feet) for her to know what she saw. 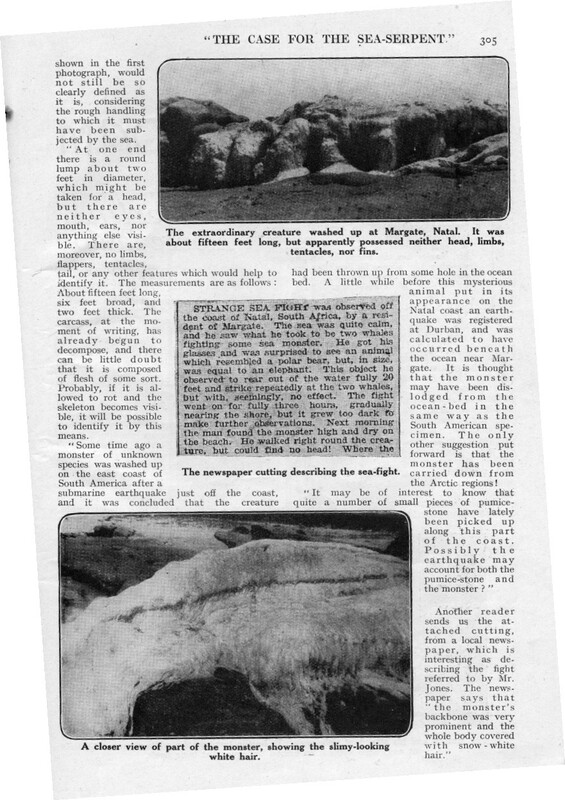 In addition, her husband and others found “enormous humanoid footprints” at the location. Something to remember: the Ruby Creek Incident occurred in 1941. Sanderson interviewed the Chapmans 18 years later. The accounts vary. The biggest discrepancy between the two retellings is where and how long Mrs. Chapman saw the sasquatch. Once she is told an animal is coming down the mountainside, according to Sanderson, “Mrs. Chapman went out to look…” Green says “she looked out the window…” Sanderson has her standing her ground while the sasquatch advanced, even quoting her: she had “much too much time to look at it.” Green suggests she fled almost immediately, through the front door placing the house between her (and her children) and the sasquatch. In other words, she could not see it as she fled, contrary to the retelling by Sanderson. But her account was backed up by tracks, and that convinced Green. Did Mrs. Chapman really see a sasquatch? Well, I’m inclined to think see saw a bear. If we view her sighting as literally told, contradictions and all, then she saw a hair covered man. Why do I think she saw a bear? First, she probably only briefly viewed the animal. She saw a huge, hair covered animal standing on two legs. We know that she had been told (warned) since childhood about the sasquatch, a cultural norm that is the equivalent to “bogie man” stories to scare children for practical reasons. Sasquatch were giant, hairy men. Why didn’t she recognize a bear, if a bear it was? We are familiar with standing bears because of photos, pictures, TV and film. Mrs. Chapman probably had no such familiarity, and may have never seen a bear standing upright. Secondly, the first person to see the animal, one of Mrs. Chapman’s children, described it as a “big cow.” A “big cow” would better describe a walking bear than a bipedal ape or hairy human. I’m speculating that she saw a bear and thought it was a sasquatch because she held a strong, superstitious belief in the sasquatch and her brief look at a two-legged animal brought to her mind a real sasquatch. The bear probably heard the commotion in and near the cabin, and stood on its hind legs to get a better look see. Mrs. Chapman, looking dead on, would not have discerned the bear’s muzzle. We may guess that much of what she later described, such as broad shoulder, were in response to later, leading questions from non-native sasquatch enthusiasts. The bear did what bears do; it broke into a barrel of fish. I have been reading this thread with a quizzical look at some of the stuff. But it is different. These apparently within the last two years or so (southwestern PA and WVA). I have no comment on the accuracy of the reports, other than to say it is the eyewitness factor once again--how depdendable, or how undependable are they. I finished reading the JSTOR article from 1984, and found it interesting. Thanks for providing the URL link. The author's basic tenet is that Huevelmans got a lot of the macrocosmic things wrong in regards to what types of things Cryptozoology covers. The Okapi entry I wasn't aware that it wasn't indeed a "living fossil," as I have seen many places so labeled. I also wasn't aware that sabre-tooth tigers are alleged to be still extant. I am curious to know more about that. But one of the shortcomings is that the article was published in 1984. More than a quarter century later, there are no doubt many new animals to add to the initial graphic in the article about what species have been found. But I do wonder about the claim that the marsupial tiger of Australia doesn't exist, as written in this published paper. It is also has been called the "Queensland Tiger," and the "Kenthurst Panther." I have a correspondent Down Under, and although our main topics that we discuss have nothing to do with "hidden animals," from time to time we cross over onto this. Here is a URL link to some (yes unverified) eyewitness reports from 2003 of Tiger sightings. Provided to me by my correspondent., who lives in Toonwoomba. One further comment on the CBS Evening News with Scott Pelley news segment on the filming of the giant squid in its native habitat (about 3500 feet down in the Pacific). I saw this segment, and it was just spooky to me. The creature, in an apparent suspended, tentacles-down "holding pattern" in the black abyss (with its fins at the top of the mantle fluttering to seemingly keep it in that position stance) was just mesmerizing. And then it moved, tentacles-forward. I dimly remember reading--in connection to the giant squid in Disney's "50,000 Leagues Under the Sea" --that when they had their squid do that, that that type of locomotion was incorrect. Yet the real thing did that. One other thing. Arthur C. Clarke wrote a novel entitled "The Deep Range." In there the protagonists managed to capture a giant squid alive, and they also chased the 1000-foot (? I am dimly recalling) leviathan at the bottom of the Pacific, where the creature got buried by a sea-quake-initiated land slide (if memory serves). I read the book a very long time ago. I'm not sure what to make of "panther" sightings. Seeing big cats on the British Ilse seems to be a fad. Most photos appear to be of common domestic cats. Although, I did find an article once that said an African Jungle Cat had been found as road kill. The assumption now is that people are letting their exotic cat pets loose. In Australia, there is belief in the Queensland Tiger, a marsupial: http://www.unknownexplorers.com/queenslandtiger.php The evidence seems very slight for the Tiger (and, of course, it is not a cat). I live in Texas where some folks distinguish between pumas and panthers. I've asked folks who are sure there are panthers (not pumas) in their woods if they have ever seen one. No, but they hear them "scream like a woman" during the night. I chalk it up to folk belief; a common domestic cat can make a racket when in heat. I do know someone who saw a "black panther" in broad daylight in Louisiana. Hard to accept such a claim. I wonder if people are not allowing for a cat, bobcat, or puma in a shaded area during a sunny day to appear dark, even black. Some people on the border believe they see black jaguars. At least one source I read stated that black jaguars are very, very rare in the wild, almost unheard of in Mexico, and people generally don't know this because zoos and films over-represent the black phase of the jaguar. Same source stated people were claiming to see jaguarundi in Arizona, where they are not known to exist. The interesting point was that only people who knew what a jaguarundi is, claimed to see it. If you didn't know, you never saw one. Last edited by jerrywayne; 28th January 2013 at 07:26 PM. Here in Vermont the term "panther" is usually understood to mean a puma, and there have been occasional sightings for many years. It's still unclear whether or not there are any around, because wildlife officials are very coy about anything they can't verify. The way I hear it, if they acknowledge an actual wild puma they have to take responsibility for it, so they deny until it can't be denied any more. One was finally seen unequivocally in Connecticut, and dismissed as an out of state visitor, though a number of people I know down in Connecticut and up here would swear they've seen them for years. Of course they're not really cryptids, since they were once known to be native, and since we know they still exist somewhere else. My guess is that, like coyotes a few years ago, they will turn out to have been coming back for some time before the officials recognize them. Plenty of places for them to hide. Back in the 1990's my mother was up in her Connecticut wooded back lot, swimming in her pond, when a coyote came up, grabbed her small dog in plain view, and took it away, presumably to devour (it certainly never was seen again). Wildlife officials stoutly denied that there were any coyotes in the area, despite frequent sightings and night choruses, until a few months later hunters started bringing in bodies. My wife is convinced she saw a puma while bicycling a couple of years ago, and is convinced she can tell the difference between this and a big house cat, and she certainly knows enough not to have mistaken a lynx or a bobcat, both of which we've met in the neighborhood, for something with a long tail. I remain slightly skeptical, but considering that she's not the only one who's seen one around here, it will not surprise me at all if someone gets a positive ID either. Our part of Western Vermont is a significant east-west migration corridor for all sorts of wildlife, and if there are any pumas hereabouts, they probably have come through here. One of these days when the weather gets a little better I intend to put a wildlife camera out where we put the garbage. We've had a bobcat and an eagle there, so maybe if we get lucky I'll catch a transient puma snacking. There is a panther thing down here where I live too. But as the former range of the Florida Panther and the Jaguar are very close to here, I always thought that there was a slim chance maybe the odd cat might be around. Though, we also have bobcats, and at night (when most sightings are reported) a fats moving male bobcat could illicit a similar response i bet. Bobcats can get pretty big, and lynxes even a little bigger, and they're fast and leggy. The Canada Lynx we saw last year was pretty impressive in size, and had a dun coat not so unlike a puma's. During the day you can spot the tail (or the lack of it) and the pointy ears, a lynx's oversized paws, and in the case of the bobcat the tabbyish fur, but as they say all cats are gray by night. If it's running you aren't likely to have time to be accurate. Help me out here please. I am not sure there is any such creature. The only jungle cat that I know is Asian, although it has a tiny population in northern Egypt......Felis chaus. Is this the animal you are referring to? Thanks jerry, but do you have something more academic than that? I have a feeling that may be a fallacious common name. If you had something with it's Latin name that would help. Wild cat popular and regional names do seem to confuse things. Mountain lions (although not a lion), pumas, cougars, etc., one example. Google African Jungle Cat you will get hits that include photos and videos. But the cat most covered seem to be the Jungle Cat, which occurs in areas of Egypt (in Africa) and Asia. There is the Felis silvestria lybica, the African Wild Cat, but it does not appear that it is what people are calling the African Jungle Cat. Here is a brief video described as an African Jungle Cat, but is probably the Jungle Cat or hybrid. Yep, the African Wild Cat is an altogether different beast, and I have seen it all over southern Africa, usually on open grassland or plains. The Jungle Cat, therefore, is the animal I linked to above (Felis chaus), and the only African version of it left is a tiny population in Egypt known as the Felis chaus nilotica. I figured he meant that the avg citizen seeing said cat would describe it as a "Jungle Cat" as they knew it looked exotic but wasn't as big or something they'd easily ID like a Tiger or a Leopard. Nothing average about the inhabitants of this forum, though. Tigers in downtown Dallas: http://www.wfaa.com/news/Tigers-on-t...-98813859.html I remember that later it was suggested people had seen bobcats, which is credible (river bottoms not far from downtown). What about going all the way in the boat?